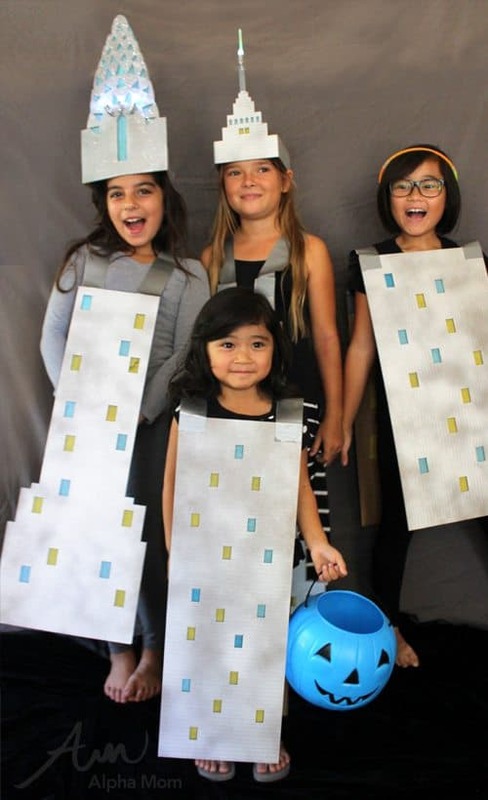 As you know we are making famous United States buildings costumes for Halloween and this post is all about creating an Empire State Building costume! Like the Chrysler Building costume I created, I made this Halloween costume with a simple sandwich board design and a crown . It’s amazing what you can do with cardboard and a few glow sticks. For this design I traced the outline of the Empire State Building from some designs I found online. I cut the top part of the building design into a headpiece (with long pieces on the sides that I taped together to fit around a child’s head) and the bottom part of the building into the body of the costume. The body consists of two pieces (a front and back– like a sandwich board). I created straps out of duct tape and attached the two sides at the shoulders. The inside of the tape I lined with another piece of duct tape so that it didn’t stick or accidentally grab pieces of long hair. Then I cut out the windows. Full disclosure: I’m a graphic artist and I sent the vector file that I created in Illustrator on my computer to my local large format printer and they cut it for me in half the time it would take me to cut it out with my tools. But if you’re the patient type you could cut this yourself with an exacto knife and a metal ruler. I’ve even created a diagram that you can use as a guide to make yourself. After I got the cut pieces of cardboard back from my printer I spray painted* (adults, always spray paint outdoors or in a very well-ventilated room) them silver. I wanted to create a lit antennae spire like the real Empire State building so I attached both a glow stick and a decorative battery-operated light to the top of the building tower with some duct tape. The glow stick worked out really well to reinforce the spire and the decorative light added the bright glowing effect I was looking for. The decorative lights have a little hole that you can stick wire through to create a stem that can be taped down to the glow stick and the cardboard. This makes sure everything stays secure during any trick-or-treating adventure. Then we waited for it to get dark and let the glowing begin! 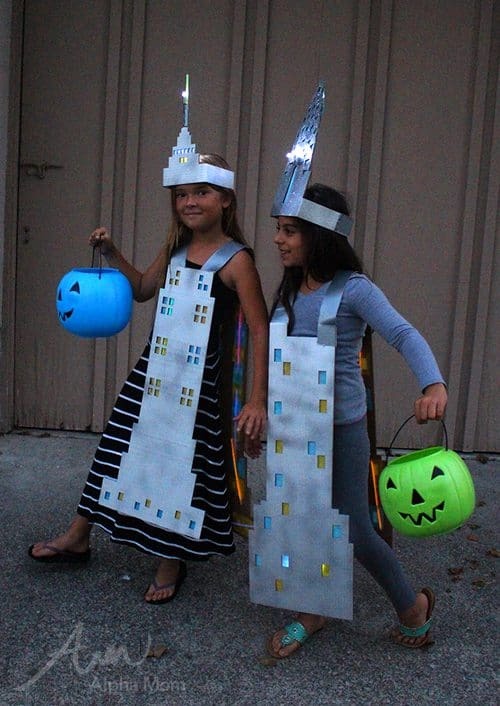 Add some friends and you have a walking skyline that’s sure to get smiles (and extra candy!) when they show up trick-or-treating. *Adults, always spray paint outdoors or in a very well-ventilated room. 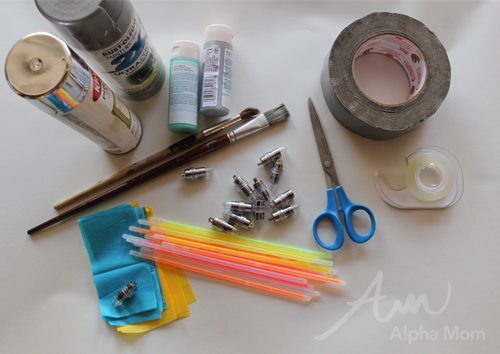 Find more ideas for homemade Halloween costumes, crafts, treats and decorations here.